Mapping the rainforest? I’ve got an app for that. When I was a kid, the one thing I wanted more than anything else in the world was a computer-in-a-book, where I could look up all the information in the world in a matter of seconds, like the one Inspector Gadget’s niece Penny had. Now they exist and they’re called Tablets and they’re connected to this thing called The Internet and I have one, and the whole world is engaged in this huge digital revolution that is, quite frankly, blowing my geeky mind. While there’s a lot of hype about the good that digital technologies can do – farmers in Kenya looking up market prices using their mobiles, street children in India using Hole-in-the-Wall computers for learning – a lot less is said about those who are being disenfranchised by the slow creep of technology across the globe. 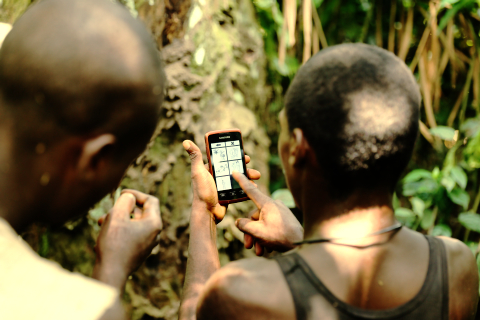 In the remote rainforests of the Congo Basin, which are inhabited by many thousands of indigenous hunter-gatherers (traditionally, but now often insultingly, termed “Pygmies”), mobile phones have barely penetrated, but the effects of modern technologies are being sorely felt. Logging companies and other extractive firms used to rely on these hunter-gatherer groups to help them navigate the forest. But the advent of cheap GPS technologies has meant that they are now able to access ever more remote areas without assistance, where they directly compete for resources with local people and open up roads that allow easier access for commercial hunters and illegal poachers. Teaching local community members how to use Sapelli. Photo by Jerome Lewis. I work with a research group at University College London (UCL) that aims to address this imbalance using an approach called Extreme Citizen Science, or “ExCiteS” for short. I’m a Social Anthropology PhD student, but I spend most of my days in the Department of Civil, Environmental and Geomatic Engineering (CEGE), working alongside a team of software developers, geographers and designers to create a smartphone application that can be used by anyone, anywhere, to collect and analyse geographic data about issues that concern them. Our app is called Sapelli– it has an interface that is modifiable and can be rendered entirely free of text and numbers, so it can be used by people who are non-literate and non-numerate, or across wide regions by people who don’t share a common language. Alongside the app, we also work on developing a participatory methodology to ensure that it is always used within a context of Free, Prior and Informed Consent (FPIC), and that it is community members themselves who choose what data they want to collect and who they want to share it with. This means that each individual iteration of the app is co-designed with local people, who advise how the app should be structured and what images to use to represent different data collection scenarios. The idea stems from the work of Jerome Lewis, who is co-director of ExCiteS and began working with Mbendjele hunter-gatherers in northern Congo-Brazzaville in the 1990s. After returning to his fieldsite following the civil war, he found that the expansion of logging activities was having a hugely negative impact on his old community. In particular, the loggers were targeting the large, emergent Sapelli trees that the Mbendjele rely on as a source of nutritious caterpillars in what is otherwise a difficult season for finding food. The logging company wanted to apply for Forest Stewardship Council (FSC) certification, which involves ensuring that local resource-use rights are respected, but their attempts to engage the Mbendjele in a participatory process were failing. The Mbendjele found negotiating resource-use in the office-based environment of the logging company highly intimidating, so Lewis worked with the community to design a set of icons for a handheld GPS that would enable them to make a map of their most important trees. The map could then be used in negotiations for the trees, making visible their otherwise invisible resource-use patterns and allowing the logging company to quickly and accurately remove the important trees from their cutting schedule. Mbendjele mapping their resources using Sapelli. Photo by Jerome Lewis. 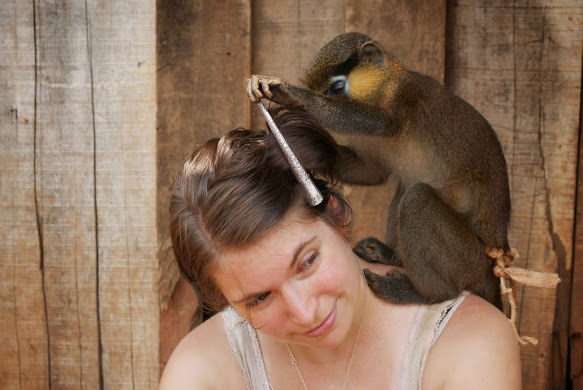 Having now completed a year and a half of fieldwork and project management within the research group, in May I headed to the Congo for six months to begin the implementation of four long-term projects – two intended to improve relations between indigenous people and extractive industries and two intended to give local populations a greater role in the management of national parks. There are a great many challenges ahead, and I’m very excited to see where this phase of research will lead not only my thinking, but that of the research group and the various projects as well. 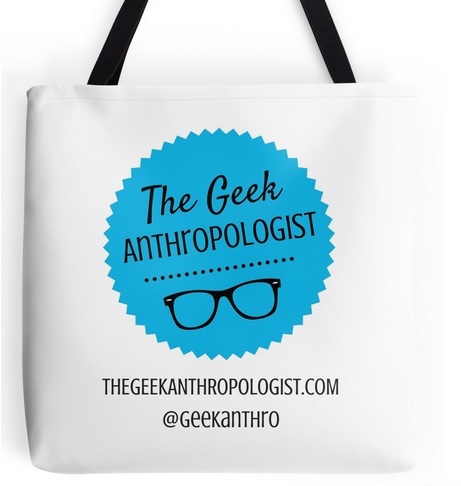 Because nothing “ExCiteS” this anthropology geek more than a technological encounter. (Except, perhaps, for a terrible pun). Gill is a PhD student in Social Anthropology at University College London (UCL) and a member of the multidisciplinary Extreme Citizen Science (ExCiteS) research group, which aims to which aims to develop digital mapping tools and participatory methods that can enable people with little or no technical, scientific, numeric or textual literacy to identify and respond to environmental challenges. 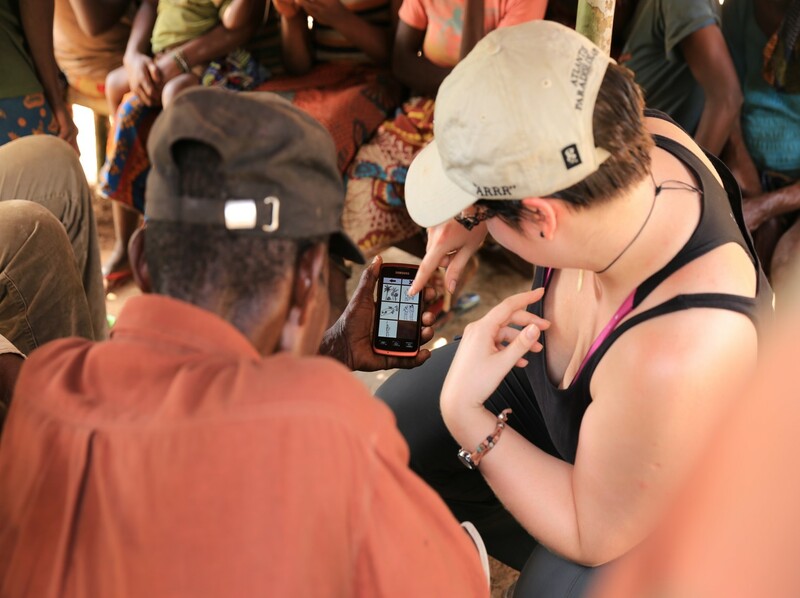 Gill spends part of her research time hanging out with software developers and engineers in London and the other part hanging out in indigenous communities in the Congo Basin, always accompanied by her trusty rugged smartphone. When not anthropologising, Gill can be found co-writing, -directing and -starring in the four-man sci-fi spectacular “Quantum Battlestar Deep-Space Voyager TARDIS Wars: The Million Dollar Space Epic” at local sci-fi events. Check out her [personal website, http:gillconquest.co.uk], or get in touch by email at g.conquest.11[at]ucl.ac.uk or on Twitter @Buffalogill. Escobar, A. (2011). Sustainability: Design for the pluriverse. Development, 54(2). Turnbull, D., & Chambers, W. (2014). Assembling Diverse Knowledges: Trails and Storied Spaces in Time. In J. Leach & L. Wilson (Eds. ), Subversion, Conversion, Development: Cross-Cultural Knowledge Exchange and the Politics of Design. Cambridge MA: MIT Press.